A bunch of us went to SW Wisconsin in mid March to celebrate our own Jon Uhlenhop's "bachelor party round two" and of coarse, to fish the creeks around Viroqua. The weather was ridiculously warm - with temps peaking in the high 80s!! 7 days of crazy warm temperatures resulted in outstanding fishing. We saw bugs in March that should not have been hatching until April and May including scattered large tan caddis, crane flies, BWO's and even some LARGER golden stones. There were not consistent hatches, but freaky non the less. 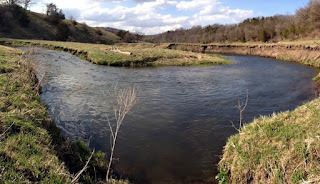 Usually, if you want to catch fish in Wisconsin in March, you use small flies- think #18 - #22. These did work - but so did big ones. One of the guys fished nothing but crane flies on top and caught fish. Another guy used nothing but a size 8 orange stimmy on top - and caught fish! I am getting older and my eyes don't work like they used to. I did catch fish on #22 midges during a beautiful midge hatch - but had a tough go of it. On day 4 I used only two patterns - a #14 Purple Para Wulff and a #14 H&L Variant - both big summer/fall dries- and sleighed them. t was confusing- but a lot of fun! We also saw green grass and buds on trees - March 18th - usually a mid April event... This is shaping up to be a strange year! Check out the picture of the 8 point deer rack I found. The bones were picked clean - not 30 feet off of a frequently fished stream. Nice rod rack souvenir that one will make! Attached are a few pictures. Get up there and fish, explore & enjoy.